Notes: It has most of the problem like the first game, but also include one more problem. - The game run through to the menu with full option and good FPS (sometimes slow). Game played well. - Problem with some text lines in the game, most of them are mess up. - Graphic and in-game color problem. Ok so I have go deep enough into the game, and what I found is the game stopped at the first cutscene. The whole game is black and nothing work. Here is the log for build v0.6-383. Most of the problem about text runs like crazy has fixed, only a few of them still looks funny. So this game appears to work fine now, except for one pretty major issue: It's impossible to examine things. 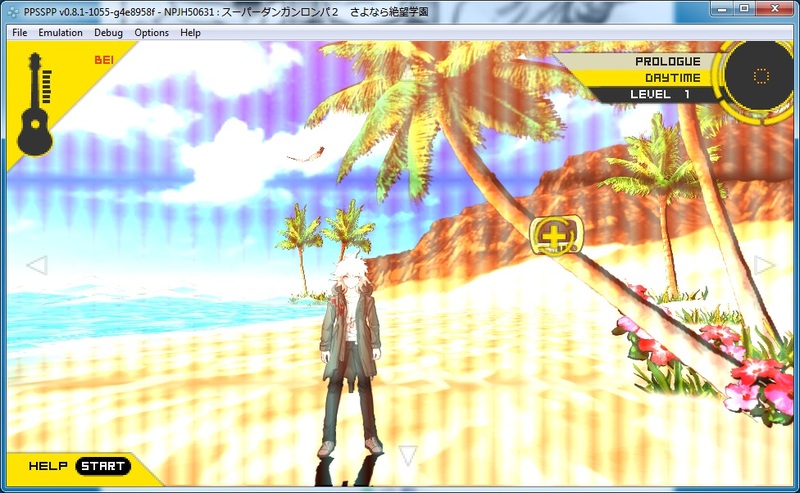 During the game, you occasionally get put in a 3D mode and can move a cursor around to examine objects or talk to people. On the emulator, the game does not recognize that you're hovering over an object/person and thus does not allow you to progress once you get to the first point that requires that. I think what's happening -- although this is frankly a complete guess -- is that the game attempts to unproject from the 2D screenspace back to the 3D world space to figure out what the 2D cursor is pointing at, and somehow completely fails at this on emulator. I've attached two screenshots, one from the emulator and one from the game running on an actual PSP, to show the difference. (05-29-2013 10:03 PM)Admiral H. Curtiss Wrote: So this game appears to work fine now, except for one pretty major issue: It's impossible to examine things. Nope, the latest dev build doesn't fix it either. (05-30-2013 11:42 AM)Admiral H. Curtiss Wrote: Nope, the latest dev build doesn't fix it either. Then u have to wait till it's fixed... Or just open a thread on github..
Hey just an update I'm running what I believe is to be the latest version v0.8.1 but there still is an issue with being unable to scroll over or "investigate" anything, the same issue that was mentioned before. The game runs really smooth aside from that, although there is an issue when going through dialogue that previous text will overlap onto the next for a moment, flickering, and then dissapear. Update: I'm currently running version 1055-g4e8958f, I enabled the frame buffer to CPU/GPU (tried both) options in the main menu but I didn't see them listed in the .ini file should I be adding them manually instead? I've tried the above solutions suggested for the original game but it doesn't seem to be fixing it I'm at a loss at what to do =/ I'm assuming I've done something wrong when modifying the .ini file but I'm not sure exactly what it might be. I'm also unsure if the changes I make to the .ini are even taking effect. here's a screenshot of my game during said issue as well as my debug console, if theres any other info that might be of help to solve this(despite it already being solved for other people heh) let me know. (08-02-2013 12:17 PM)Monokeros Wrote: Hey just an update I'm running what I believe is to be the latest version v0.8.1 but there still is an issue with being unable to scroll over or "investigate" anything, the same issue that was mentioned before. I find that picture funny since my custom build (which I've been working on for a few months) has the same branding issue, although I was able finish Super Danganronpa 2 on my build without any problems with object detection. ...ignore the english text. I was just playing around with the ISO because I got bored after finishing the game so I made an un/packer for data and text in the game. ...also not sure where the purple came from under Nagito's waist. That wasn't there when I took the picture. Could you share said build? Or explain what kind of sorcery that you cast on it to make it work so lesser mortals like myself can enjoy this super awesome game? I learnt Gandamu's sorcery and casted it upon my build.